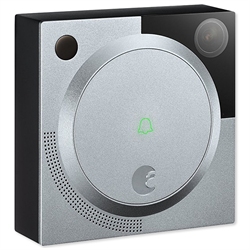 The August Doobell Pro lets you see who's at the door and talk with the visitor from anywhere inside or outside the home. The Doorbell Pro works day or night with full colour video and a built in spot light so you can see the visitor at night. Built in motion sensing can send a push alert to your smart phone automatically when someone approaches so you can proactively see who's there. Adjustable sensitivity reduces false alarms. Add optional (paid) cloud recording to save video clips for up to 30 days. Motion Activated August HindSight captures footage so you see who was there from the time they approach until they leave. When paired with any August Smart Lock, it can allow users to let visitors into their home even when they aren’t able to answer the door themselves. The package comes with a the August Doorbell Cam Pro, mounting hardware and a USB charging dock. The Doorbell Cam Pro can easily be integrated with wiring from an existing doorbell for a quick, no hassle DIY install.